One of these men may have been Pleasant Crump. It is difficult to find a verified picture of him, but all of these guys look both pleasant and somewhat crumpy, so that’s good enough for me. They say it’s good to be known for something. I wouldn’t agree that just anything will do (see : anyone ever on TMZ), but in principle I see nothing too wrong with that statement. We here at the Funny Names Blog definitely share the view that it’s great to be known not just for a funny name (though that’s a great start) but also an accomplishment or two. Say, inventing stuff, or being Postmaster General, or maybe hitting people in the face really hard. So what was Pleasant Riggs Crump known for? Well, I would almost be willing to bend our rules for such a wonderfully named individual, but I don’t have to! 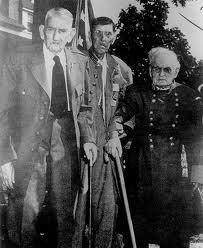 Mr. Crump was famous for being the last surviving soldier who fought for the Confederacy during the American Civil War. Wikipedia tells us that other people have claimed to deserve this honor since Crump’s death, but their claims have been unfounded. I mention these people only because their names include Thomas Riddle, William Lundy and John B. Salling, which are kind of funny. So the honor remains Pleasant Riggs Crump’s. He wasn’t only the last surviving Confederate veteran at the time of his death at the age of 104, he was also the last survivor on either side who witnessed General Lee’s surrender at the Appommatox courthouse in 1865. An undeniable part of history then. (Ironically, he lived most of his life and died in a town called Lincoln, Alabama, having relocated there after the war). 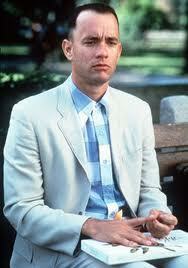 No, Crump, not Gump! Sigh. When Crump was born at Christmas time in 1847, James Polk was president. A century later, President Truman named him an honorary Colonel after he had reached triple digits. For those of you keeping count, that’s 23 Presidents he lived through. Gladly for him he did not live during the time of 24-hour television news, or the election coverage surely would have killed him of exasperation long before he turned a hundred. Instead, he lived on his farm in the house he built for himself for 78 years after the Civil War until his death in 1951. Colonel Pleasant Riggs Crump was not just a man with a fantastic name. He also lived an eventful life, one that made him known for something. And for that, we thank him. This entry was posted in Uncategorized and tagged bio, comedy, funny, funny names, history, humor, movies. Bookmark the permalink. If only the south had won the war, the krumping trend would have caught on years ago, and would be referred to by its proper name: crumping. Darn Jayhawkers! (Narrowly beats out Redlegs as my favorite derogatory term for Union soldiers). I think Crump is the dude on the right. He looks the most pleasant. Where do you FIND these names?! I have contacted Deed Poll and have a meeting first thing tomorrow morning to officially change my name to Pleasant Riggs Crimp (I modified it a bit to sound more feminine). The black headed old boy in the middle is Uncle John. He died when I was about 9 years old. He liked a few house down the road from my Grannie Kinkead’s home. I would walk with my mother from Grannies house to visit momma’s kin. Uncle John said his hair was black because it had never been washed. I think the one on the right is Walter, he was from Texas.